Forum members on our sister site Chiswickw4.com are frequently found complaining of the preponderance of coffee shops on their High Street. Readers of this site could be forgiven for shedding a caffeine-free tear and wishing that we could have just one place to sit and watch the buses go by while mulling over a mocha. However it looks as though our prayers have been answered. Maison Cafe has opened on the High Street, opposite the Post Office, and offers many of the things that residents of everywhere else take for granted. Fresh coffee, good cappuccino, paninis with all sorts of fillings and little silver tables to sit and watch our little bit of the world go by. Pausing there earlier this week, BrentfordTW8.com found that customers where unanimous in their praise - the most common reaction being along the times of "about bl**dy time". 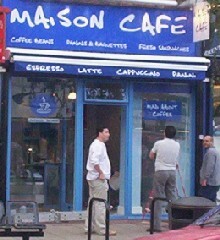 Maison Cafe opens between 8am and 6pm from Monday to Saturday, serving sandwiches, cakes, muffins, pancakes - and coffee.